Timanfaya National Park, in the southwestern part of the island of Lanzarote, is unique because it is the only national park in the world to have been developed by local residents. Also unique is what the park offers, including a volcanic field filled with a variety of geological and geothermic phenomena. In fact, the reserve is almost entirely made up of volcanic soil, and volcanic activity continues beneath the surface, although there is only one active volcano, the one the park is named for. Attractions include some geysers by the restaurant. Although the landscape is strange and stark 180 different plant species do survive in the park. 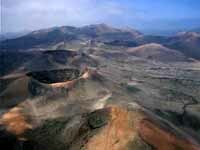 The whole of Lanzarote is a UNESCO Biosphere Reserve, and Timanfaya is one of the core protected areas. Access to the park is strictly regulated to protect the delicate ecosystem and visitors must stick to designated routes. A journey through this landscape is hugely enriched by having a guide so don't shy away from organised tours. Some tours offer camel rides as part of the package. In the restaurant, which has spectacular views, visitors can end their guided tour of these wonders by enjoying a meal cooked on geothermal heat emanating from natural steam vents and geysers. Opening times: Daily from 9am to 5.45pm.